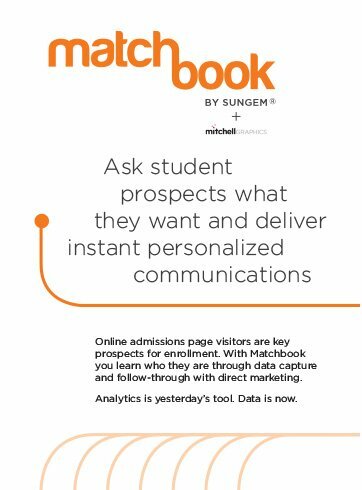 Matchbook: Ask student prospects what they want and deliver instant, personalized communication. In a world of instant information and data, the need for immediate, personal and relevant communication is a key challenge for colleges and universities looking to grow enrollment. Those seeking to capitalize on students researching options for higher education online rely heavily on analytics to make generalizations as to who their target prospect is. Many are collecting general contact information through a simple form and mailing or emailing the complete course catalog to interested prospects. In this model, a student seeking business school information for example is receiving a course catalog with the complete campus guide in which only a few pages apply to them. The process is costly with high volume printing and mailing expenses felt by the marketer and is more likely to be disregarded as the student is asked to wade through information to reach their area of interest. Advanced search has changed little over the years, leaving it stale and boring. With Matchbook, a cloud-based online and direct mail marketing tool providing real time market research, visitors can find what they’re looking for and enjoy the process. “Matchbook isn’t a catalog of everything your campus is. It’s a discovery process through which you learn who your prospective students are and what they are looking for,” said Dylan Valade, creator of Matchbook and president of its parent company, Sungem. Customers interactively select what they’re interested in, based on a school’s offerings, and Matchbook provides them with personalized information. That preference data is then collected and used to instantly publish customized electronic and print marketing materials and catalogs. No more wasted print. No more anonymous leads. Highly involved decisions like choosing a college are exhaustive. Matchbook helps streamline this process and allows your customers to learn more about you in an interface and process that is relevant to them. By choosing their tastes and preferences along the way, their customized Matchbook provides them with a college or university’s best content in their interest areas. To test drive the process, visit TryMatchbook.com. For more information about Matchbook, contact Jeff Johnson at 1-800-583-9403. A small, East Coast university, has seen a 28 percent conversion rate for high school students reached through Matchbook email campaigns in 2013. 80 percent of the high school freshman, sophomores and juniors requested a personalized hard copy brochure in addition to the instant online version. Real-time market research shows us that high school students are most interested in financial aid and residence life content, which were previously assumed to be secondary to academics and course information. Acting on the Matchbook data across all marketing channels increases student engagement.